Rabbids crazy rush is one of the most enjoyable games to play on any platform. The game is filled with this aura of silliness that makes it a more than fun way to pass time. The game is centred around helping the Rabbids succeed in a rather ambitious plan to reach the moon. The player is tasked with the duty of collecting cans that will provide the much needed gas to power the Rabbids’ moon-bound balloon to its destination: The Moon. Available on both ios and Android, the game is one of the newest on both platforms having been released by Ubisoft on 23rd February 2017. Although there is no official version of Rabbids Crazy Rush for PC, The game can also be played on Windows 7/8/8.1/10/XP and MAC laptop or desktop computers but we will get into details of that later. First, let’s dive into the features that make this game a wonderful way to pass time and more than just an ordinary runner game. Use some of the most craziest vehicles to navigate past obstacles and collect cans. 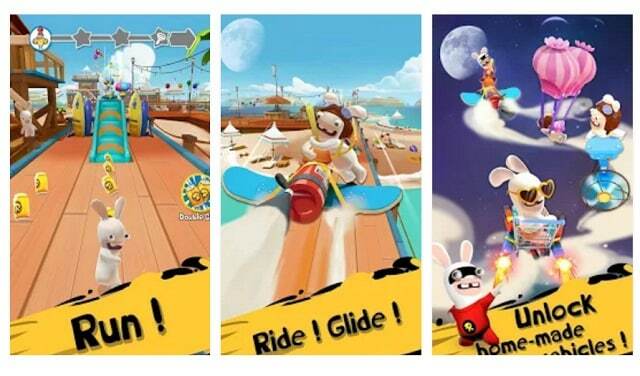 Rabbids Crazy Rush comes packed with hundreds of random and funny missions that are both fun to play and engaging. Some of the crazy missions include insane stunts like hitting your rabbids against walls and getting blown right-out of the sky. Players are able to discover a number of home made vehicles. The vehicles are most times created from some rather crazy and hilarious materials. The vehicles include a cart propelled by magnets and a giant glider created out of pink pants. Players can suit up their Rabbids in awesome suits that make them look hilariously cool. You can race as Biker, Ninja, Luchador or even as Captain Underwear. There are plenty of other suits available which you can use to pimp your Rabbids. Each suit gives players unique powers and incredible abilities. Players are required to collect fragments which help them to win suits from the rather crazy washing machine lottery. You can also play with friends and compete with them for the top rankings on leader-boards. Players with the most number of cans collected rank higher on the leader-boards. The overall winner is the first player to get his/her Rabbids to the moon. The game is free to download and play. However, there are a number of items that can be bought through in-app purchases. You will not really need to buy those though, and you can easily complete the game without having to dish out a penny. 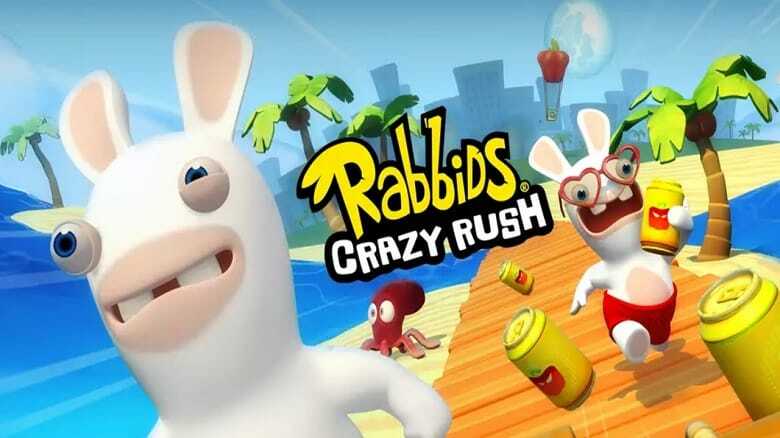 Rabbids Crazy Rush is definitely one of the best runner games out there and certainly is one of the wackiest and funniest runner games ever developed. Another masterpiece from Ubisoft, the game comes packed with high quality graphics and game-play that make it a joy to play. And with the features mentioned above, there is no doubt that Rabbids Crazy Rush is a must-play for those that love runner games and also, those that like playing light games on their Desktop computers or Laptops. Sometimes when playing Rabbids Crazy Rush, bluestacks ask you fee to pay but gives you option to download some apps. Every time it asks you just select “Install apps” and continue using it free. I hope you enjoyed this article, please rate and share. If you have problems running Rabbids Crazy Rush on desktop or any other issues, leave a comment below.